After a storm hits, turn to EASY ROOFING in Tyler, Texas for roof repair. 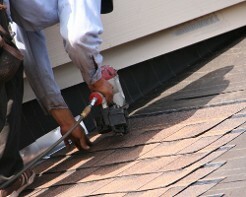 Our team specializes in emergency roof leak repairs, including fixing chimney flashing and other damaged elements. We strive to match your shingles to make your roof look as good as new. Some insurance companies will pay for you to have a company come out and tarp over the roof to prevent further damage, and we can stop the leak until the weather permits the time needed to make the repair. For your convenience, we offer a 6-month warranty on our labor for repairs. Contact us to receive a free estimate for our roof leak repair services.